There are 7 posts filed in Calaos (this is page 1 of 1). After many months of development, Calaos v2.0 (https://calaos.fr) is finally out. This is the first stable version released made available thanks to the work of the community. Besides the change of license to GPLv3, work has been done on cleaning the code, modularity of all layers, better handling of the hardware, using gettext for english and translation, and many bug fixes. Lets continue this series on the Rule system. Today we are going to create some more advanced rules, and explain how it works under the hood. In this example we have two light in a room. And we want that when we press the switch both light goes ON simultaneously. 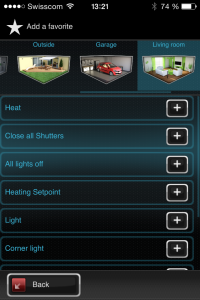 That will work when both lights are synced, but the problem that need to be solved is that when lights are controlled directly (from calaos_home or calaos_mobile), and then pressing the switch, they could be out of sync. (first is ON and the second is OFF). The only way to put both lights in sync again is to do it manually. No so smart! As you saw in the action popup, you can choose an action for the light from a predefined static list. Possible actions are for ex: toggle, true, false, … But there is a button right under the action, Dynamic value. This is where you can choose a value from an other IO. 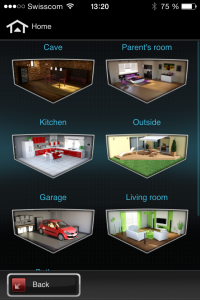 In concrete terms, after clicking the button you will be able to choose an IO, and when the action is executed, the value will be extracted from the selected IO. Lets do that for the Light 2. So now in our example the first action is to toggle the state of the first light, and then assign that new state to the second light. 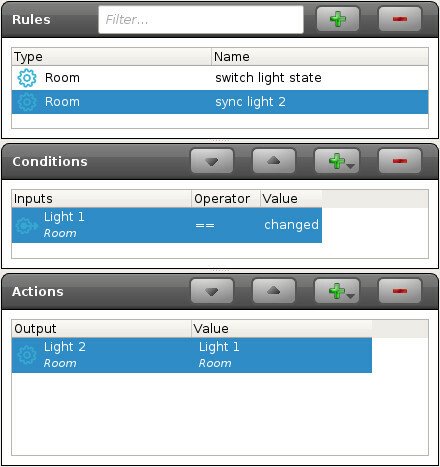 Now with such a rule, if the lights are not in sync, the second light will automatically be set at the same state. Of course this example can be repeated with other type of IO, like shutters. 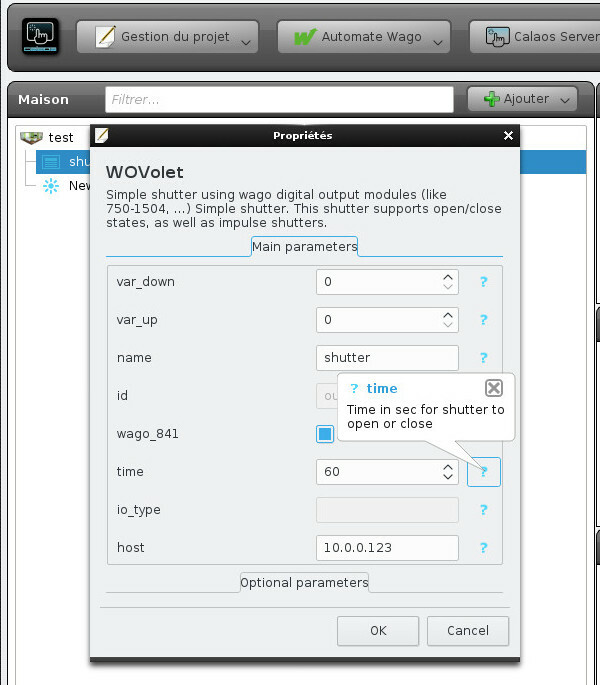 It’s extremely powerful when controlling multiple shutters with just one button. 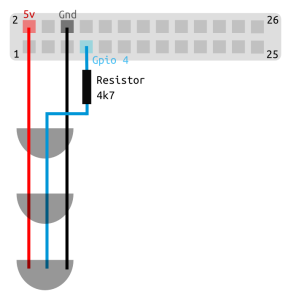 And a second rule with a condition that checks for the Light 1 state change. If the state changes, we update the state of the second light from the first light. The fundamental difference between the two solutions exposed here is that the sync is done everytime the state of Light 1 changes, even when you control the light from the user interfaces. 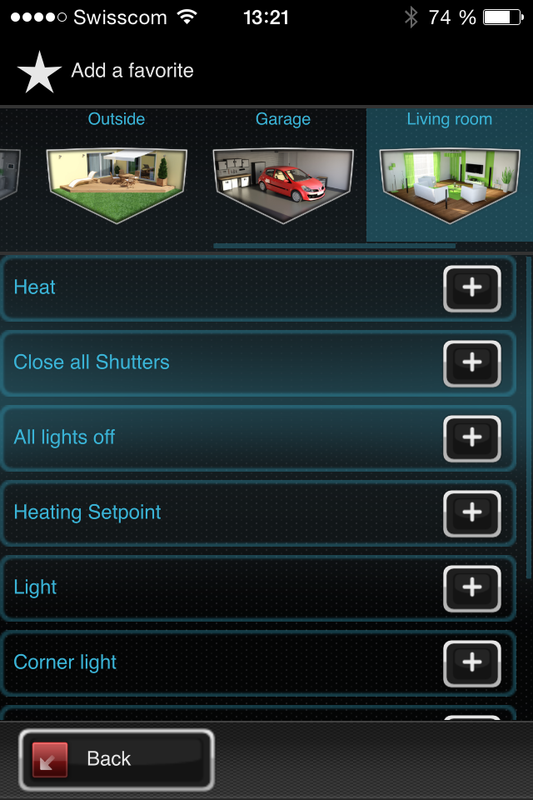 In the first solution that’s not the case, the second light is only synced when you press the switch. The second approach is good when you need to link multiple outputs. 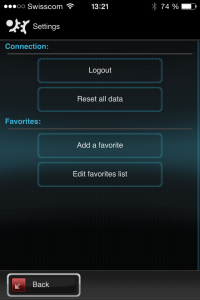 You only need to do an action on the first IO, and the second will be updated automatically. What is Calaos OS? That question is asked quite often. Configure SSL and certificated on your web browser. 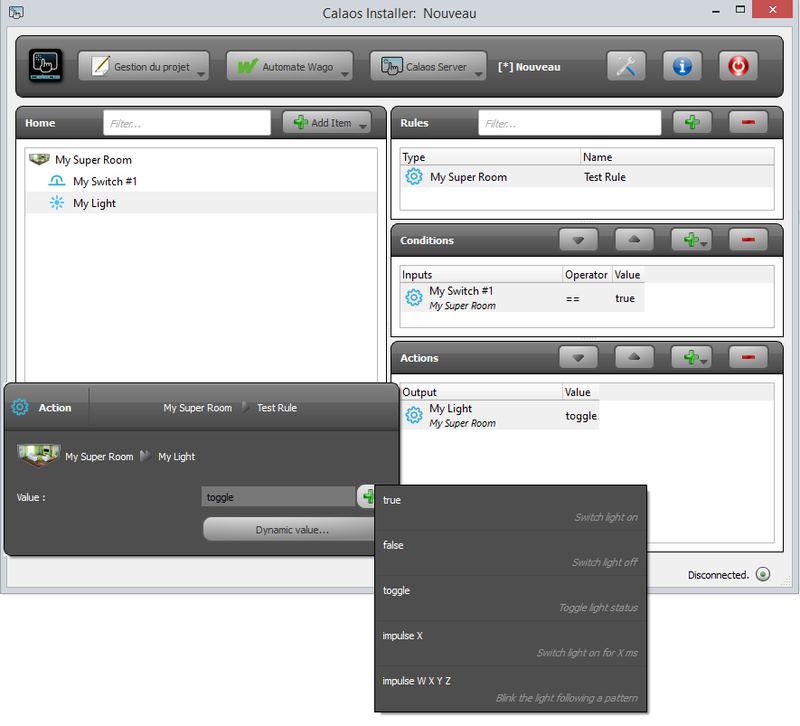 It’s needed if you wand to connect to calaos_server remotely, it’s the case for calaos_installer and for the mobile application. SSL is there to guarantee that the connection between your mobile and calaos box is encrypted. Otherwise all the informations you send are readable. Some people have skills to get all this stuff running on regular Linux distributions, but for the majority of people, that’s not the case, and they should use Calaos OS, as it embed all the required software in a single image. It’s also covering a lot of hardware configuration and their specificities. The Idea of using Calaos OS is to keep all the hard and complex work of integration inside Calaos OS, and give to the users a real good experience. 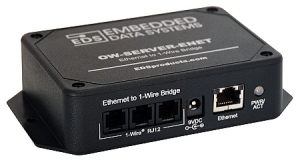 Calaos OS is based on the Yocto/OpenEmbedded. This is an amazing build system, which allows us to create a specific GNU/Linux distribution four our specific needs. If your electronic board, or your PC is not currently supported by Calaos OS. It’s most of the time just that we never tried it. So it’s maybe not a big thing to add your new architecture in Calaos OS. If the architecture is supported by Yocto, there is a lot of chances that adding it to Calaos OS is easy. Take a look at http://layers.openembedded.org to see if a yocto BSP exists for your hardware. Even that it’s simple to add a new architecture, it takes a lot of time and space on your harddrive to build a full image of Calaos OS. So please be patient and keep in mind that you need a real big machine to build an image. Currently i’m using a Core i7 machine with 8GB of ram, and it take arround 2hours to build a complete image for Raspberrypi. If you get into troubles, don’t hesitate, to ask questions on the forum : https://calaos.fr/forum or on IRC (#calaos on irc.freenode.org) We will guide you. A question that comes very often in Calaos is “How does the rules system works in Calaos? 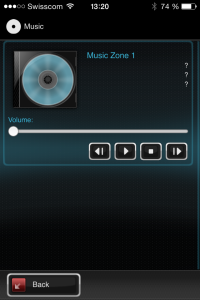 How to do [name what you want here]?”. I’m going to start a series of posts to explain that with some real examples on how it actually works and how to do advanced tricks with Calaos. So, lets start with the basics. 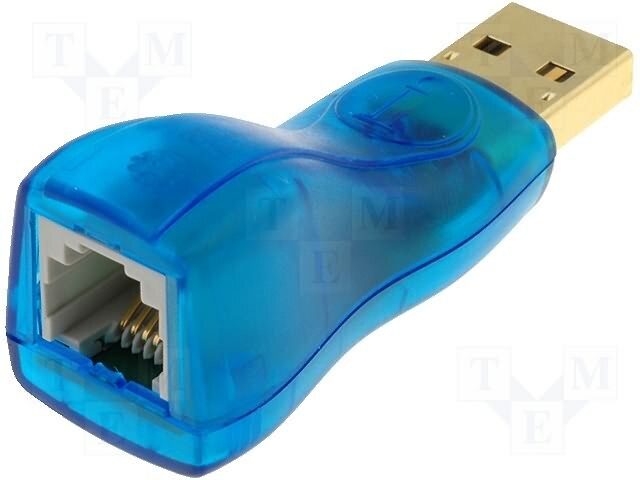 At the root of the entire system sits calaos_server. 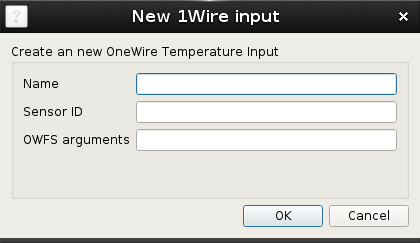 This is the main component of the system and its purpose is to talk to the underlying hardware (Wago PLC, 1-wire, Zibase, MySensors, …), execute some user defined rules, and export some API for the different user interfaces (calaos_home, calaos_mobile, webapp, …). 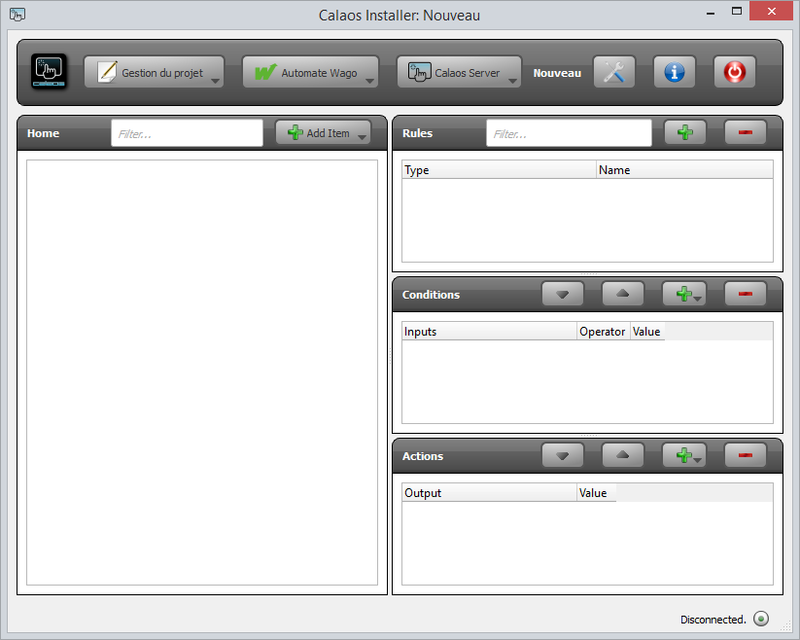 calaos_server acts as a daemon process and do what the user has configured in calaos_installer. 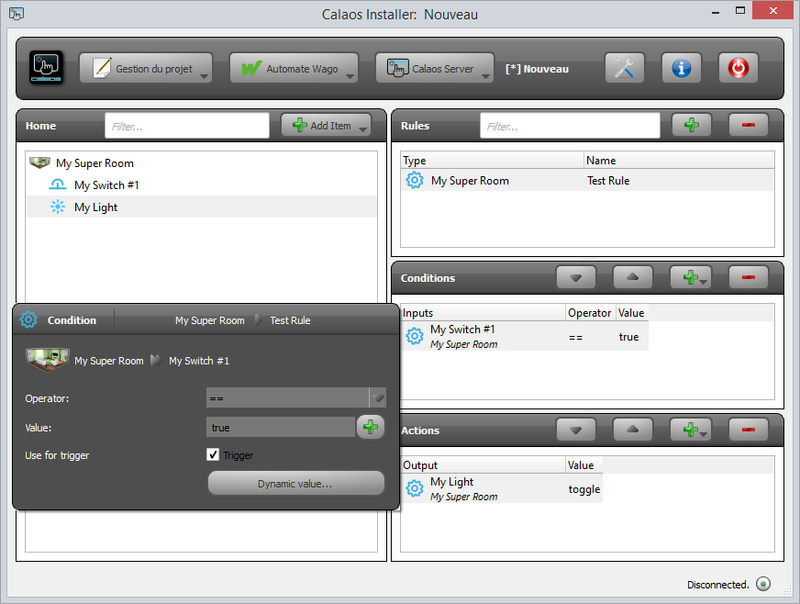 Two types of configuration needs to be done, first declaring Items and devices in rooms (left part of calaos_installer), and finally creating rules using those items (right side of calaos_installer). 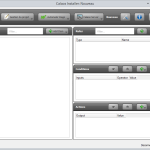 In calaos, all items declared are directly accessible from any user interface. 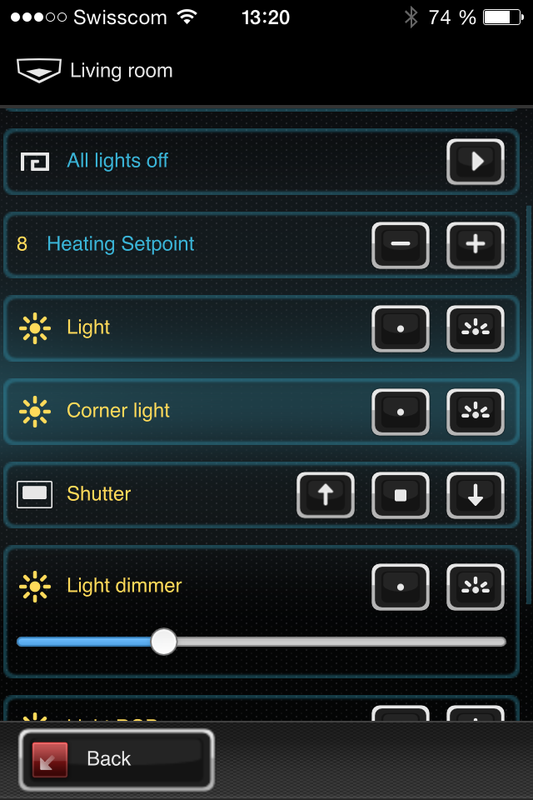 For example, if you create a light, you can control that particular light on any interface. But when you create a switch, it will not do anything unless you create a rule that tells calaos what to do with your switch and eventually do an action like switch on or off your light. This is where rule comes in. A rule is basically an action that is triggered by an event. 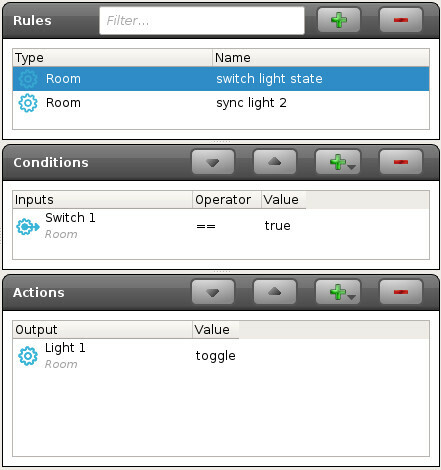 In our switch/light example, the event of pressing the switch will tell calaos to execute an action on the light. 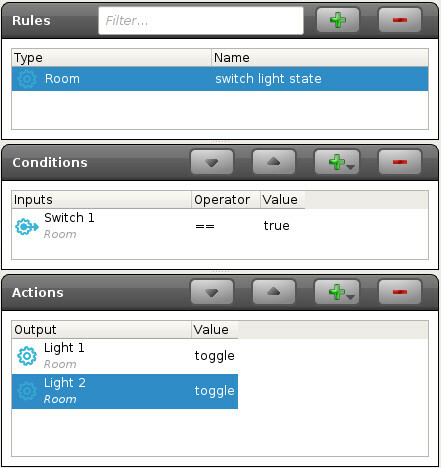 Let’s start with a basic example of a switch that can switch on/off a light. First create our two devices, a switch and a light. Next we are going to create a rule by clicking on the + button in the top right. Enter a rule name and type (for categorization) and click Ok. A new empty rule is created. You will see an empty condition list, and an empty action list. Let’s add the condition by dragging the switch in the condition list. When adding a condition and clicking on it, you will see a popup appear. 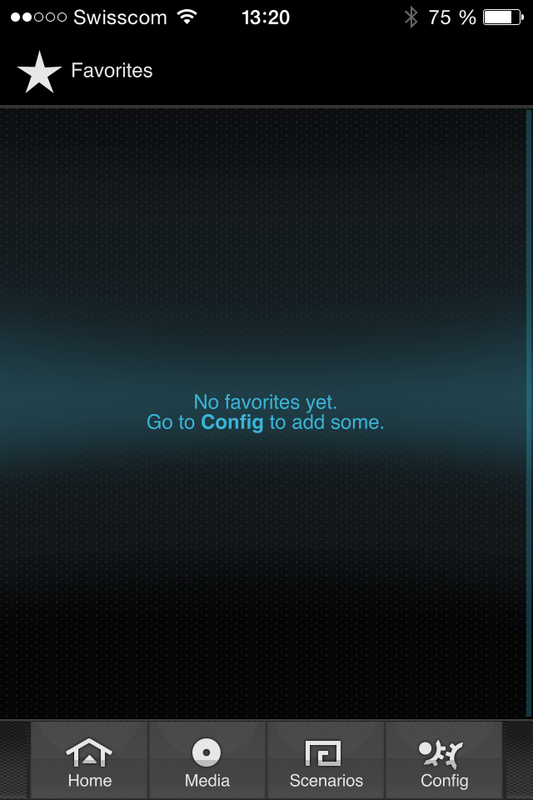 Here you can configure the condition. For now we can use the default values that means the event of: When the switch is pressed (true means the switch is active). 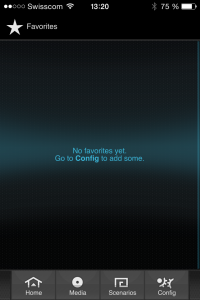 The first part of the rule is done, we need now to add an action to be executed after the switch is pressed. Lets drag the light to the action list. 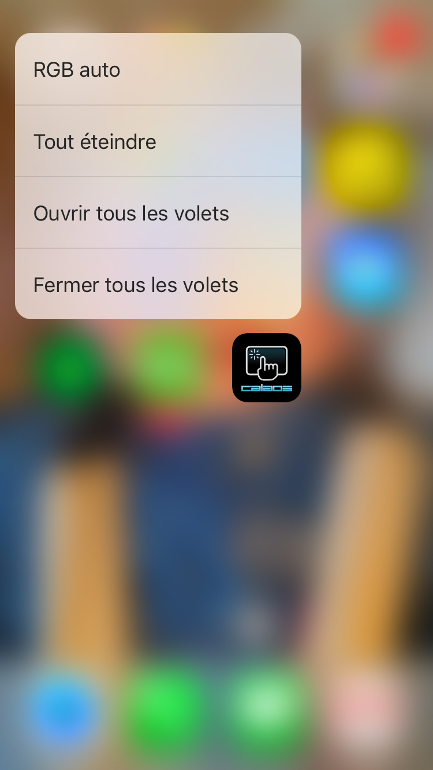 The same kind of popup appears after adding the light to the list, it will let you configure what action to do for that particular light. Every items supports different kind of actions. 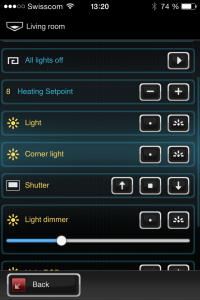 The default action for a light is toggle which means invert the light state on every rule execution. 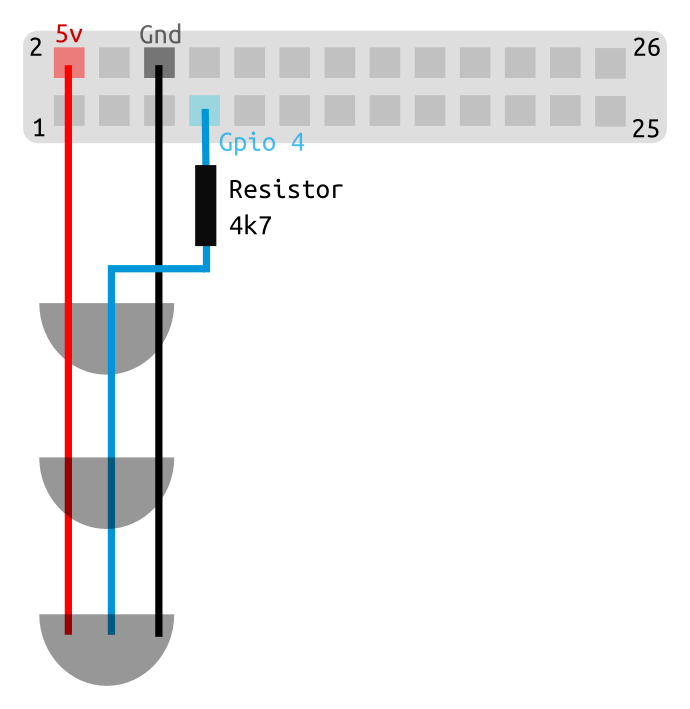 Now we have seen how to create a basic rule to handle a switch press that will toggle a light. Of course the same thing can be done for all the items and devices in calaos. All hardware devices (shutter, temperature, …) can have different actions or events, and calaos_installer tries to list them all in the action list. In the next post we will see how to create more complicated rules. Calaos can also have some virtual items (timers, time ranges, variables, …), and they behave exactly the same regarding the event/action system. But some history first. At the beginning we only had one (not so good) mobile app that was for iOS. And it was only allowing you to use a native iOS interface from your local network, and when outside, it loaded an ugly web UI from calaos_web. 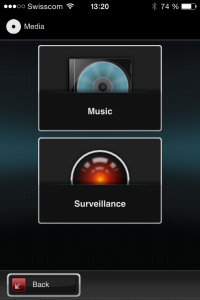 No Android. Then a few years ago I started working on a complete rewrite of the iOS app. Entirely native. No more web. It was never released, because I had a lot of pain to make fully working every time Apple updated their SDK. And again, no Android. Then, 3 months ago I wanted to try something new. 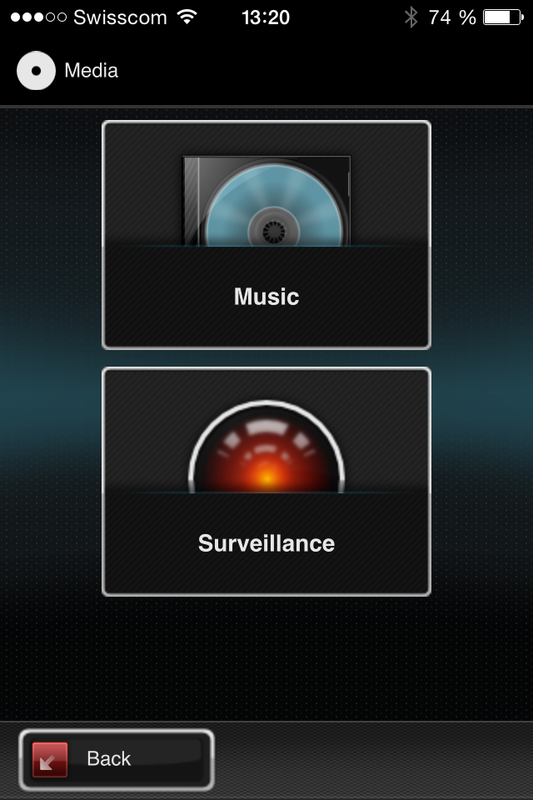 Qt Quick for mobile Apps. Since I’am used to Qt development for quite some time now, it was a great opportunity to see if Qt is now ready for mobile development. Result: We have now a new Calaos Mobile app that runs on iOS and Android! The project is available as always on Github and to build it you will need the Qt SDK. 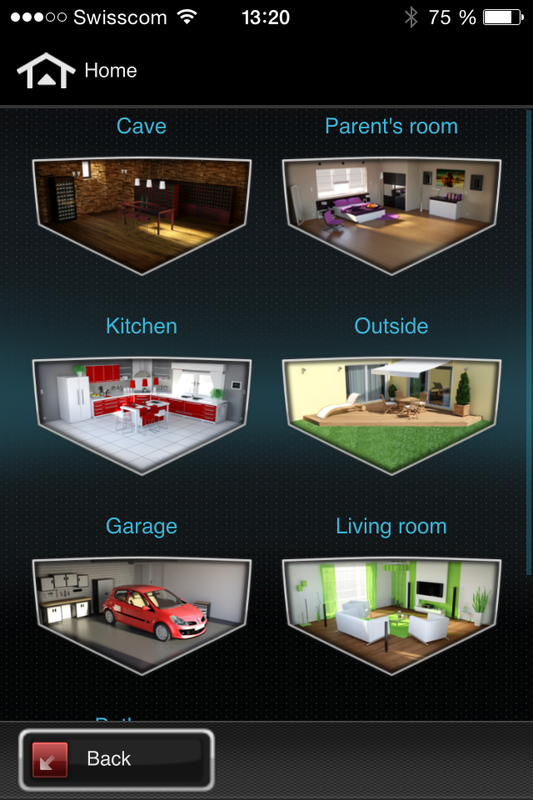 Favorites is what you get on the main screen when the application starts, and it allows you to add your preferred items directly to the home page. This means less clicks to start your often used scenarios. For now only standard items can be added to the favorites view, but later I’m going to add some more special favorites items, stay tuned! The mobile app will be available soon in the Apple Store and Google Play.